Prior Lake scored a pair of touchdowns in the first quarter to beat Maple Grove for the first time ever as Eden Prairie looms. 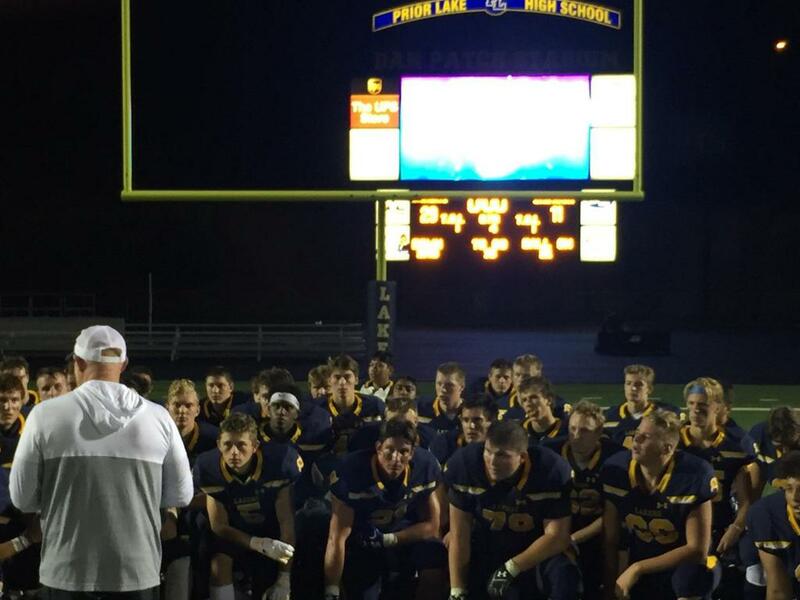 The fifth-ranked Prior Lake Lakers bookended the game with long touchdown passes as they defeated the seventh-ranked Maple Grove Crimson 29-11 September 6 at Dan Patch Stadium. The win for the Lakers (2-0) was their first over the Crimson (1-1) since the teams started playing annually in 2014. The two teams began the game with a bit of a feeling out process, each going three-and-out on their first possessions but Prior Lake caught a break on the ensuing punt return as returner Jacques Jacox ran the ball back to midfield and then was hit late by a Maple Grove player resulting in a 15-yard penalty, setting the Lakers up at the Crimson 35-yard line. The Lakers took a shot to the end zone on the very next play. Quarterback Colin O’Connor took the shotgun snap, dropped back, stepped up in the pocket and fired the ball deep down the middle of the field, connecting with wide receiver Parker Ellis for the Laker touchdown. New Prior Lake kicker and soccer player Mike Nelson added the extra point to put the Lakers up 7-0 early. The Laker defense made one of the best plays of the night on the next possession. After the Prior Lake defense stopped Maple Grove’s explosive running back Evan Hull on the first two plays, the Crimson faced a third-and-12 on their own 15-yard line. Lineman Jarod Henderson applied the pressure on Maple Grove quarterback Nate Elmes, who was coming off a play-action pass. Elmes scrambled around before firing the ball across the field, right into the arms of linebacker Noah Benson, who intercepted the ball and returned it 18 yards for a Laker touchdown. The two-point conversion attempt was no good, leaving the Laker lead at 13-0 about midway through the first quarter. Neither offense did much on the next few drives until the Crimson got going to start the second quarter. Elmes found Hull on a screen pass on a third-and-long, who picked up the first down. Elmes connected on a long pass a couple plays later to get inside the Laker 10-yard line and Hull capped it with a touchdown run on the next play. The Crimson drew the Lakers offside twice on the extra point attempt, leading Maple Grove to go for two and convert, cutting the Prior Lake lead to 13-8 with 9:40 to go until halftime. The Laker offense drove down the field on the next possession but was stopped on a fourth down attempt inside the Crimson 20-yard line. However, the Prior Lake defense force yet another three-and-out and a short punt set the Lakers up already at the Crimson 43-yard line. O’Connor then led a seven play touchdown drive that included a big 20 yard completion to Ellis on a third down and was capped by a 1 yard score by running back Keaton Schroeder. O’Connor’s pass on the two-point conversion was incomplete, making the score 19-8 with 36 seconds left in the first half. Maple Grove used all of those 36 seconds to end the half, with Hull leading the offense down the field and getting out of bounds with one second on the clock to set up a field goal attempt. The 32-yard kick was good, cutting the Laker lead to 19-11 at halftime. The Crimson drove down the field again but the Laker defense got another big stop on a fourth-and-7 on the 31-yard line when safety Will Jones intercepted a deep pass. A three-and-out by the Laker offense and a short punt put the Prior Lake offense in almost the exact same position. Facing a fourth-and-8 at the 32-yard line, the Crimson completed a pass but the receiver was tackled short of the marker, turning the ball over on downs. The Lakers moved down the field on their next drive in part due to a targeting penalty. O’Connor had to leave the game on that play and did not return. His replacement at quarterback, Nate Raddatz, came in and completed a couple huge passes. First, Raddatz completed a screen pass to running back/linebacker Sam Emmerich, who picked up a first down on a third-and-7 from the 39-yard line. Raddatz then connected with Ellis on a third-and 16 on the 37-yard line with a nearly identical pass to the first touchdown of the game for another score. Nelson’s extra point was good to stretch the Laker lead to 26-11 with 6:58 to go in the game. After the ensuing kickoff, Prior Lake’s defense forced a four-and-out with the Crimson turning over the ball on downs at their own 30-yard line. The Lakers used a strong rushing attack to drive all the way down to the 1-yard line and Nelson put the game away with a field goal in the closing moments to get us to the final score 29-11. Statistically, the Lakers were led by Ellis, who finished with five catches for 114 yards and two touchdowns. O’Connor led the Lakers through the air, completing 9 of 11 passes for 99 yards and a touchdown. Schroeder was the leading rusher with 46 yards on 11 carries. Benson, lineman Ethan Kuehn and safety Austin Gordon led the Laker defense in tackles with eight apiece. Despite beating a top ten team in Week 2, it won’t get any easier for the Lakers in Week 3 as they will go on the road to take on traditional powerhouse and defending state champion Eden Prairie on September 14. The Lakers head into the matchup ranked fourth in the September 12 edition of the Star Tribune Class 6A rankings while the Eagles enter ranked sixth. The Eagles are coming off a 14-0 loss to Lakeville North in Week 2 after hanging on to beat Eastview 14-9 in Week 1. Offensively, the Eagles are led by University of Minnesota commit quarterback Cole Kramer. Kramer has yet to throw a touchdown this year but threw 14 during the regular season in 2017, including one against the Lakers. The Eagles defeated the Lakers 24-0 in Week 3 of 2017 at Dan Patch Stadium. Kickoff against Eden Prairie on Friday September 14 is scheduled for 7 p.m. at Eden Prairie High School. Be sure to check back next week for a recap of the Eden Prairie game and preview of the Week 4 matchup against Minnetonka.